I know too well how the Haitians feel, and the tears cloud my eyes as I write this post. It has been almost two weeks since the earthquake hit Haiti and they have now raised the death toll to 150,000. Some reports fear that number may even double. Can you even picture 150,000 dead people? I couldn't picture it in my mind - 150,000 people. 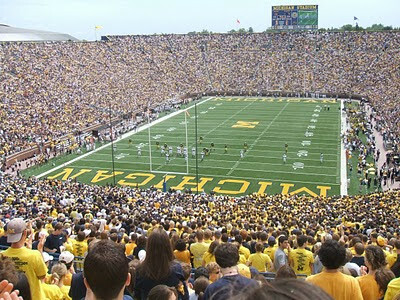 For comparison, below is a photo of a football stadium with a capacity of 106,201. My apologies if some of you are put off by the image I am implying - but I needed to see how many people I needed to pray for. I hope you realize it too. They need our help. 150,000 people. That's a lot to wrap your mind around. I know, though, that you can picture one or two, all too clearly, and that's enough for you. If each of us could help just one, it would make a huge difference. It seems there's just one overwhelming disaster after another, these days. Am I just more aware of these things now, or has it been like this for the last 45-50 years or more? That's a tragic picture, Rey, It's unimaginable without the picture. It 's utterly sad. You're right. The scale of this tragedy is unimaginable. Hi Rey. That image helped me visualize the Haiti tragedy. God be with us all. We've all been through a disaster at least once in our lives, the less luckier ones several times over, but never in this scale. Hi Tessa. Yes, it did for me too. God Bless. This tragedy opens our eyes on how fragile humans are. The disaster could happen anytime, anywhere and we should be grateful for still alive. The Haitians desperately in need of all the help they can get. May God bless the volunteers who are still there and the poor souls who are restless over the lost of loved ones and family. May God continue to be with them. Hopefully no more death..
efforts over so they can concentrate on relief operations. Reyjr Random Travel Tip 001: Get good luggage! UPCAT 2010 Results - Congrats Cousin! Win a Free Boracay Vacation Package for two!